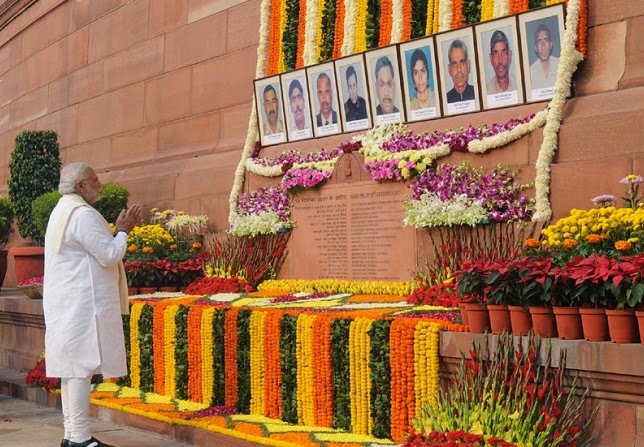 1) Leaders paid homage to martyrs of Parliament attack: Parliamentarians led by Rajya Sabha Chairman Hamid Ansari, Prime Minister Narendra Modi and Lok Sabha Speaker Sumitra Mahajan on 13 December 2014 paid homage to martyrs on the 13th anniversary of the attack on Parliament. UPA Chairperson Sonia Gandhi, former Prime Minister Manmohan Singh, Minister of External Affairs Sushma Swaraj, Home Minister Rajnath Singh and other members attended a solemn ceremony held in the premises of Parliament. On 13th December 2001, five heavily-armed gunmen stormed Parliament complex and opened indiscriminate fire, killing nine persons. The martyrs included five Delhi Police personnel, a woman Central Reserve Police Force (CRPF) official, two Parliament watch and ward staff and a gardener. A journalist, who was injured, died later. All five terrorists were shot dead. Four accused, including Afzal Guru, were arrested for the attack and found guilty after a trial. Guru was hanged last year in February. 2) India lost first test against Australia by 48 runs: India virtually snatched defeat from the jaws of victory, slumping to an agonising 48-run loss in the pulsating first cricket Test against Australia despite captain Virat Kohli's gallant second successive hundred in the match which was held in Adelaide. Chasing a competitive target of 364, India were cruising along comfortably at 242/2 before the hosts staged a dramatic comeback to grab eight wickets for 73 runs and take a 1-0 lead in the four-match series. The Indians folded for 315 in 87.1 overs with Kohli (141) and Murali Vijay (99) being the only ones to notch up noteworthy knocks even as seven batsmen departed without touching the double digit mark. 3) Kohli becomes second player to score twin centuries on his captaincy debut: Virat Kohli, with his knocks of 115 and 141 in the two innings of first Test against Australia, has become only the second player to score twin centuries on his captaincy debut. The first player to do so was former Australian captain Greg Chappell, against West Indies at Brisbane in 1975. Kohli is only the second Indian captain to hit two centuries in the same Test. The first was Sunil Gavaskar, against West Indies at Kolkata in 1978/79. It has been 53 years now since an overseas batsman scored two centuries in the same Test in Australia. West Indies’ Rohan Kanhai was the last batsman to do so, way back in 1961. He is only the fourth Indian player to score two centuries in a single Test match, with the other three being Sunil Gavaskar (thrice), Rahul Dravid (twice) and Vijay Hazare (once). Kohli’s 256 is also the highest number of runs scored by any player on his captaincy debut. 4) India suffer close 3-4 defeat against Pakistan in Hockey Champions Trophy semi-final: A misfiring India squandered a golden opportunity to create history as they went down 3-4 against arch-rivals Pakistan in a high-voltage semifinal of the Hero Champions Trophy hockey tournament in Bhubaneshwar on 13 December 2014. It was a good chance for India to register their best-ever performance in the history of Champions Trophy but they couldn't achieve the feat and buckled under pressure. India's best-ever showing in the Champions Trophy is a bronze medal in 1982 edition of the tournament in Amstelveen, the Netherlands. Earlier, Olympic champions Germany survived a spirited fightback to snap world champion Australia's five-time title run by eking out a hard-fought 3-2 win and enter the summit clash. 5) Dineshwar Sharma appointed new IB chief: Dineshwar Sharma, Special Director in the Intelligence Bureau, was on 13 December 2014 appointed as the agency's new chief and will take charge on 1st January succeeding Syed Asif Ibrahim. A 1979 batch IPS officer from Kerala cadre, Sharma, who has been working with the agency for the past 23 years, will have a two-year tenure. An official announcement said he will take over as Officer on Special Duty (OSD) with immediate effect and will take charge as Director of Intelligence Bureau after the retirement of Ibrahim. 6) LS passed bill on coal block allocations: Lok Sabha on 12 December 2014 passed a bill which provides for fresh auction of 204 coal blocks de-allocated by the Supreme Court in September with the government allaying apprehensions of some parties that the legislation would lead to privatisation of the sector. 7) Asha Bhosle received Lifetime Achievement Award at DIFF: Noted Indian playback singer Asha Bhosle was honoured with the Lifetime Achievement Award at the 11th Dubai International Film Festival (DIFF). The 81-year-old 'Piya Tu Ab Toh Aja' hitmaker was presented with the prestigious award for her decades of dedication to Indian cinema during the opening ceremony of the festival. 8) Salman Khan is the richest Indian celebrity in forbes list: Salman Khan has emerged as the celebrity with the highest earnings in 2014, according to a Forbes list. The actor grossed earnings of Rs 244.5 crore in 2014, according to the magazine. It is for the first time in three years since Forbes started the rankings that Shah Rukh Khan has been toppled from the top spot. Shah Rukh Khan's money ranking in 2014 dropped to number 2 with earnings of Rs 202.4 crore. 9) Bengaluru-based techie arrested for ISIS twitter account handling: Bengaluru-based engineer Mehdi Masroor Biswas, who was named by UK-based Channel 4 as the man behind terror group Islamic State's (IS) most influential Twitter handle, was on 13 December 2014 arrested from his flat in Bengaluru and slapped with charges of "waging war" and unlawful activities.